Emails flew back and forth and eventually we had a plan for Friday evening which relied somewhat on the 'you can't miss it' aspect of Bill & Eileen's car. The plan was thrown into some confusion when it transpired that the tank had been scrapped and they have a new car. No-one fell off the wire bridge although a few people chickened out and paddled instead. The consensus opinion was that the wires on the bridge have slackened so anyone small will find it difficult to cross. After reaching the hut the inevitable technical gremlins started - the instructions for the generator implied that it took a few 'pulls' to get going. After about an hour and having tried every possible combination of levers & switches we finally realised that the gas bottle was empty... Meanwhile the 'water team' had no better luck 'cause the stream had dried up. Saturday was a beautiful sunny day with a brisk wind to keep us cool on the hills. Kenny, Alison & Anne C drove round to the Ben and did Tower ridge whilst Bill, Eileen, Gillian, Alison W & myself walked from the hut and did An Garbhanach, Na Gruagaichean and Binnein Mor. We got to the top of Binnein Mor at 2.15pm so the obvious continuation was onto Binnein Beag. Even on a nice day it's uninspiring so instead we sloped off downhill to paddle in the river. Blissful. Meanwhile the Ben party had sneaked into Fort William for tea using the excuse that their tea was in the freezer in Edinburgh! 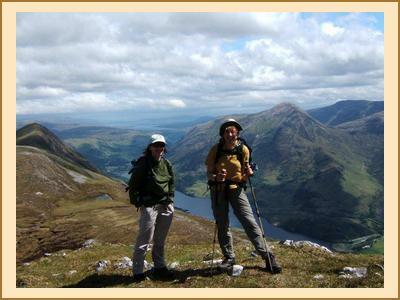 Keith & Nicola joined us for Saturday night having walked in over Na Gruagaichean. Sunday didn't look quite so promising although the cloud was fairly high. Our first task though was to get out of the glen without getting eaten alive. Keith & Nicola set off walking back over Binnein Beag to their car in Kinlochleven whilst Kenny & Alison were, we thought, climbing in Glencoe - no, they were at the end of Glen Nevis waiting for the AA man to turn up. Bill & Eileen headed into Fort William to stock up on supplies for their backpacking trip whilst Gillian was going to Killin to spend the week Corbett bagging. Alison, Anne & I set off in fairly grey weather to do Beinn n Caillich and Mam na Gualainn from Kinlochleven. Half way along the ridge the cloud moved eastward and we finished the day in warm sunshine with brilliant views. On Sunday we drove to Strathan on Lock Arkaig, walked up Glen Dessary and camped for 2 nights near top of the Glen. Midgophobia resulted in the third night spent at a'Chuil MBA bothy. On Sunday (evening) Monday and Tuesday respectively, we climbed corbetts Sgurr Cos na Breachd-laoigh (phew for the name and the climb), Sgurr na h'Aide, and Carn Mor. 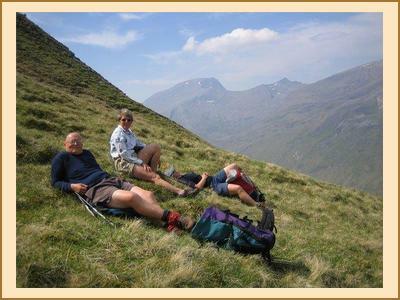 A memorable introduction: Walking east on the forestry track 1 mile from a'Chuil, not so far from the rough bounds of Knoydart, we met a not-so-young cyclist, travelling west on a well loaded tourer. He greeted us "Ah, glad to meet you. I've come from Land's end, heading for Fort Augustus today. Am I on the Great Glen cycle route?". WELL!! He was a disappointed man when we showed him the location on his road map.